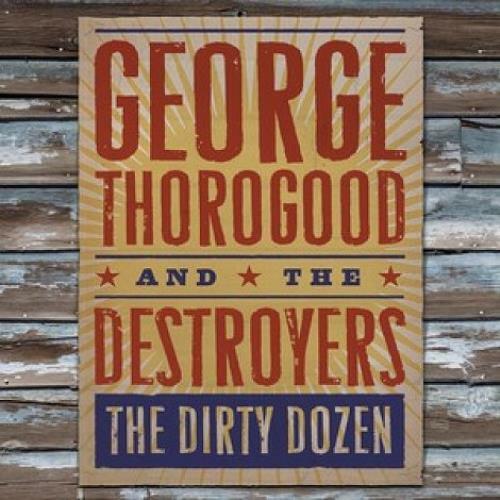 GEORGE THOROGOOD & THE DESTROYERS The Dirty Dozen (2009 UK 12-track CD album - George Thorogood & The Destroyers return with 'The Dirty Dozen', a scorching new blues-rock album pairing six new studio recordings with six classic fan favorites, including three popular tracks [previously out-of-print in the U.S.]. Launching the new recordings is Willie Dixon's swaggering 'Tail Dragger', vividly illustrated by Thorogood's vocals and guitar, followed by his new take on John Hammond's version of 'Sleepy' John Estes' 'Drop Down Mama,' a rocking jam that's driven by Thorogood's muscular guitar playing, as well as new recordings of Muddy Waters' 'Born Lover', Bo Diddley's 'Let Me Pass', 'Twenty Dollar Gig' by Mickey Bones, and The Holmes Brothers' 'Run Myself Out Of Town'. The fan favorites open with Thorogood's previously out-of-print guitar and sax-propelled take on Willie Dixon and Howlin' Wolf's 'Howlin' For My Baby', followed by Howlin' Wolf's 'Highway 49', a bona fide juke joint roof-raiser loaded with slide-laden guitar riffs; alongside two other previously out-of-print tracks: Chuck Berry's 'Hello Little Girl' and country standard 'Six Days On The Road'. 'Treat Her Right' and 'Blue Highway' are also included).